Has Law School Become a Waste of Time? 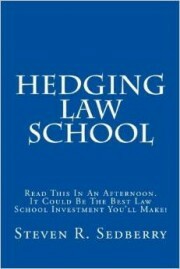 Author Argues for the Law School Program in "Hedging Law School"
Nashville, Tennessee, February 3, 2015	(Newswire.com) - Are the halcyon days of law school and legal careers a thing of the past? Is it worth spending three years of a student’s life in this postgraduate program, only to risk huge debt and limited employment opportunities? With law firms imploding and high unemployment rates among law graduates, should prelaw students look elsewhere for career satisfaction? 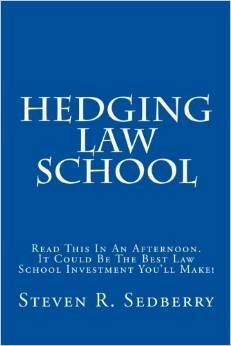 In his new book, Hedging Law School (CreateSpace, 2015), author Steven Sedberry argues that law school is still worth the investment, but cautions students to investigate carefully before taking the plunge. At the same time, Sedberry cautions students to carefully balance their career goals against their law school choice. He argues that rankings are only one criterion in the law school investment decision. Sedberry knows what he is talking about. After a twenty year career in corporate America, Sedberry decided to fulfill a lifelong dream of going to law school. It was a personal decision, but also a significant investment decision. In Hedging Law School, Sedberry evaluates the law school decision faced by students from both perspectives. Steven Sedberry is a practicing attorney, author, blogger and speaker. He is the author of Hedging Law School and Law School Labyrinth- The Guide to Making the Most of Your Legal Education (2nd Ed., Kaplan Publishing, May 3, 2011). Sedberry is the vice president and general counsel of an international apparel business, has a BBA from the University of Texas at Austin, and a law degree from Vanderbilt University Law School.